Aguas Calientes is a very small town, but very colorful..
After the exhausting four days trail those baths were really something to rest my bones. Boleto (Boleto Turístico General, or BTG) is the admission tickets to some sites in around Cusco. If included sites matches with your plan, it is wise to purchase the Cusco Tourist Ticket. How do they lift those 15 tons stones? How they place those stones so neatly? 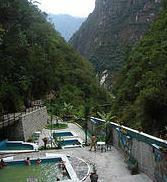 Aguas Calientes means (Aguas - Water, Calientes -hot) hot springs. So they do have hot springs in Aguas Calientes. People who are really exhausted by hiking the trail usually visit this place. Not a very sophisticated place though. Even those who are tried walking in the ruins may find this place useful. It is not far from the town. This town is so small, nothing actually far from here. From Plaza de Armas take the Avenida pacacutec to the east, north east. Go up the mountain, maybe in ten minutes you will reach the springs. There you will see underground hot sulfur springs bubble up from the rocky ground. Aguas Calientes municipality has a small complex here. They have polls with different temperature. Temperature of water is between 38ºc and 46ºc. You will find changing rooms and bathrooms there. And if you need to eat something, there is also a small snack bar for you. It is open from 6am to 8.00 pm. And the price of the admission ticket is $2.00. You must have swimsuit, towel and sandals to get in. Sandals can be rented here though. They have sulfurs in the water. Water of these springs are good for bones. At least that what locals say. This thermal bath is popular among the locals due to this reason. There is another swimming pool complex Just outside and below this hot springs complex. Usually local children come to have swims and fun and play games at that complex. That one is not part of this hot spring complex though.